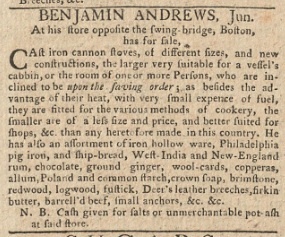 Although cast iron ovens were becoming an option for open hearths in the late eighteenth century (see previous post), cast iron had been put to other uses early on, not only for cookware like pots and pans but for other more complicated products, and for export, as this ad from the Pennsylvania Gazette in 1769 attests. Elizabeth Furnace referred to in the ad was an “iron plantation” in Pennsylvania and, because of the remarkable preservation of many of the original structures and the archeological work that has taken place there, is an invaluable source of information on iron production in colonial America. Read more about this complicated process here. Benjamin Andrews’ ad states that a large version would be “suitable for a vessel’s cabbin” —I somehow never stopped to think about how one might keep warm or cook on a ship. The ad further states that the stove might serve in “the room of one or more Persons, who are inclined to be upon the saving order; as besides the advantage of their heat, with very small expence of fuel, they are fitted for various methods of cookery.” (I am inclined to be upon the saving order!) Finally, “the smaller are of a less size and price, and better suited for shops, &c. than any heretofore made in this country.” And if you don’t want to buy a stove Mr. Andrews has many other items for sale among them: chocolate, ground ginger, and crown soap. Two orphaned sisters, Ame and Elizabeth “Betsy” Cuming, had been helped by Elizabeth Murray Campbell Smith to set up a small shop in Boston where they gave sewing lessons and sold goods imported from Britain. When Smith went to Scotland, Christian Arbuthnot Barnes, wife of businessman Henry Barnes, kept her friend informed about the situation of shopkeepers after Bostonians had resolved to boycott British goods. Marlborough, November 20, 1769 Last thrusday, which was Thanksgiving Day a Ball was given by Mrs. [James] Murray at Brush Hill [in Milton, Massachusetts] to a number of Gentlemen and Ladys from Boston. Miss E. Cumings was one of the Party. Their goods and ours are arrived in very good order, which has caused a Commity [Committee] from the Well disposed [the patriots] to wait upon them and write to Mr. Barnes with a desire that the Goods may be stored till further orders. And so they are to better purpose I hope then they design’d them for; they are well Charg’d and I dare say will have a quick Sail [sale]. In short those dareing Sons of Libberty are now at the tip top of their Power and . . . even to Speak disrespectfully of the well disposed is a Crime equal to high Treason . . . When the deluded multitude finds they have been led astray by false maxims they may Possibly turn upon them with their own Weapons, what they are many innocent Sufferers have fatally expearanced. This is my Private opinion, but how I came to give it is a mistry for Polliticks is a Puddle I never chose to dabble in. Barnes wrote again to Smith about an announcement that appeared in the newspaper denouncing the Cuming girls for continuing to sell boycotted goods. Oh how I long to have one political Laugh with you would you not be deverted to see Squire Barnes and the Two little Miss Cumingses Posted together in a News Paper as Enimys to their Country; do Bless you, send us a little Dash of Politicks from tother side the Water that we may see something that has the appearance of Truth, for our well disposed support such a vast quantity of lies with their other articles that they begin to find a Difficulty in vending them. . . . and now Madm I have only to wish you a Merry Christmas and take my leave of you. . . . The letters appear in In the Words of Women on pages 14-15. 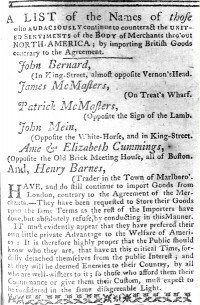 The front page notice in the Boston Gazette of January 22, 1770, shaming those who refused to honor the boycott of British goods, can be seen in transcription here.